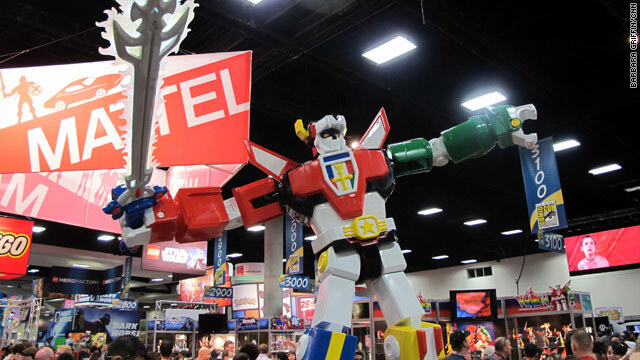 With an animated series, an upcoming movie and yesterday's release of "Voltron: The Final Battle" (collecting the final eight episodes of the classic 1980s anime series), Voltron is bigger than ever now. No surprise then, that a fan-made short film, imagining how the "Voltron" saga might end, has over 200,000 page views so far on YouTube. CNN Geek Out: Where did you come up with this idea? Albrecht: Well, I'm a huge Voltron fan from when I was a kid and I was looking for something to shoot after I finished my first short "Neverland." I'd always heard rumblings of a "Voltron" movie and was disappointed when it never happened, so this initially was my idea for the opening scene of the live action "Voltron" movie I'd like to make. [Editor's note: As mentioned above, a "Voltron" movie is currently in development.] Then once it was written, I knew my buddy Tim (Timothy Omundson from "Psych") would be perfect for it! I asked, he said yes, then we shot it. With, of course, the production design magic of Greg Aronowitz, the man literally made me a three foot red lion for the last shot... epic! CNN Geek Out: Why did you decide to go the direction you did with it? Albrecht: For whatever reason I'm just drawn to more dramatic stories. I'm actually known mostly for comedy work on my two current web shows "Diggnation" and "The Totally Rad Show," but for whatever reason the darker side of sci-fi is what peaks my interest. My previous short film was also a dark thriller about a father whose son is abducted by a strange entity. Also, I really wanted to show people that, if done right, low budget sci-fi can have great emotional impact. CNN Geek Out: Would you like to see the story expand from here in some form? Albrecht: As I said before I'm a huge Voltron fan, and yes this is the opening scene for a live action Votron movie I'd like to make someday, but really I just wanted to make something that people would enjoy. I'm always looking for my next project and I go batty if I don't have something in pre/post production so I said, "why not?"